The aim of this research article is to focus on the tradition and the role of Buddhist monks and novices with respect to the Ten Thai Arts and Crafts during Rattanakosin Period. The research found that the role of monks and novices as related to arts and crafts work can be traced to the Tripitaka Buddhist Scriptures in the section of monastic disciplines or Vinaya Pitaka. There is evidence from the time of the Buddha that monks received the Buddha’s permission in conducting Navakam (construction) by themselves or supervising someone in the repair of five kinds of Senasana (lodgings): temples; central shrines; traditional thatched-roof houses; empty abodes or uninhabited spots; and caves – including the structural elements of door panels, windows, ceilings, moral paintings, stairs, arched entrances, beds, and stools. The role of monks and novices also included training in Navakam for laymen. Their roles in arts and crafts work developed onward to the Rattanakosin Period of Siam with prominent construction work in monasteries which has been codified into the Ten Arts and Crafts Work. The monk and novice’s craftsmanship includes the roles of craftsman, supervisor, instructor or trainer, disciple, and conservator pertinent to the monasteries. Through the study on traditional construction, some standardization has been developed institutionally into the system of the Non-Formal Education established in the Dhamma Studies School according to the ideas regarding educational management of Somdej Phra Thep Rattana Rajasuda Siam Boromraja Kumaree since 2007 until the present time (2014). This systematized direction has continuously maintained the connection between Buddhism and the Ten Arts and Crafts Work as a cultural inheritance in Thai society. The purpose of this paper is to examine forms and contents of the narrations-negotiations in Nang Yai (large shadow puppets), Ban Don Temple, Rayong Province in the following episodes: 1) the birth of Phra Ram’s two sons, the performance of the horse sacrifice (a royal Vedic ritual known as Ashvamedha or “Upakara horse release” in Thai), the fight between the two sons of Phra Ram and their two uncles, Phra Phrot and Phra Satarut, up until Phra Ram invites Nang Sida to the return to Ayuthaya (all compose by Mr. Chalerm Maneesaeng); 2) the prologue, Mr. Amnat Maneesaeng’s version; 3) the prelude, chap ling huakham dance (with selection of either the white or the black monkey) and the additional sepha used in the performance, Mr. Amnat Maneesaeng’s version. The study reveals various values of narrations-negotiations in the folk performance heritage. Firstly, there is evidence of the usage of Kap Yani 11, Kap Chabang 16 and Rai Yao that has continued from the past to today. The narrations are related to the ‘leftover leathers’, while the negotiations seem to be quick-performed dialogues among the characters. Secondly, the research shows the creation of both form and content by adding klon bot lakhon and klon sepha together with mention of the names of songs, which indicates the integration between this performance and lakon ram (dance drama). The narrations-negotiations in Nang Yai, Ban Don Temple is evidence of an oral literary tradition before the development of written literature as can be seen in the repetitions found in bot phakmuang (dialogue used in royal palace scenes), the shorter negotiating dialogues (compared with other versions) and the irregular narrations-negotiations. All of this reflects characteristics of an oral tradition through the adjustment of narrations-negotiations at the play speakers’ convenience. 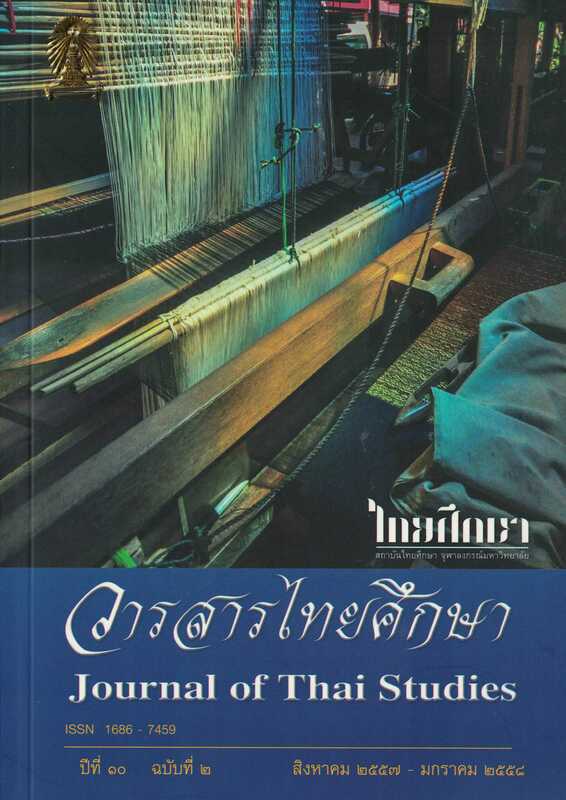 This article aims to examine the process of weaving Phrae-Wa silk by Phu Thai ethnic groups, located in Phon community, Khum-muang, Kalasin Province. Such a process has taken on the role as an important economic scheme of the community. The study focuses on two main aspects: the dynamic and expansion of the knowledge of weaving clothes; and the role and status of the community in managing the community to be a self-sufficiency business of the Phu Thai people in Baan Phon. The findings show that the process of Phrae-Wa silk weaving was developed through collective wisdom and experiences, instead of merely being produced for economic profit. The Phrae-Wa silk represents cultural heritage that conveys the essence of the Phu Thai ethnic group since its origins. Such cultural heritage then has been bound to a business system in a transition role of the Phrae-Wa silk as the traditional wisdom of the community. The silk product has become a substitution for a better quality of life in the community. Hence, people have adapted to change and transformed their weaving process from household commerce to a community business. The traditional weaving which served as the people lifestyle and culture accordingly has become commercial weaving. The transition of the weaving process reveals the community’s approach and transformation according to the situation from the external society. From the application of their traditional wisdom, the community has created opportunities for their earning and living. In addition, the group of Phrae-Wa silk weavers has been transformed into a community organization to promote the people’s compatibilities and strengths and contribute to the progresses of the people’s various capacities, both directly and indirectly. Therefore, this has become a good source to serve other potential development in the community. The weaving helps the community engage in other complementary activities, such as home-stay, garments, mulberry farming for silkworm, etc. The above mentioned demonstrates that the Baan Phon community has been able to retain its traditional wisdom, which was then developed and applied to the community’s way of earning a living. This also reflects social change without eliminating the traditional culture. The Phrae-Wa weaving of the Phu Thai ethnic group in Baan Phon manifests the bond of the community’s cultural conscience from the past to present. This can be an indication, particularly, to encourage the community’s strength and sustainable self-reliance. The purpose of this research was to study Indigo dyed fabric as cultural products of the Sakon Nakhon province which represent the Phu Tai ethnic group and to describe the process and revival of Indigo dyed fabric at the present time. The research found that Indigo dye fabric is intellectual heritage from their ancestors. The local wisdom of Indigo dye fabric developed along with the weaving of the fabric and their fabric culture. Becoming an expert in weaving and dyeing has been a socialization factor for Phu Tai women. In the past the Indigo dyed fabric was manufactured to meet the lifestyle of the family and other traditions without sign value thought. At the present, Indigo dye fabric has become an important cultural product of Sakon Nakhon province. Although in the past the production of Indigo dye fabric product was used only for personal use, it is now one of the sources of income for the local community. Since Indigo dye fabric has become one of the sources of income of Sakon Nakhon province, in particular, and the economy of the country, in general, there should be encouragement and promotion of the products in other provinces and countries at regional and global levels. The objective of this article is to study the developmental history of Koh Lanta, both economically and socially. This article will focus on the dynamics of the pluralist society and diverse cultures of the people in Koh Lanta, Krabi Province during the period of the official development of the tourism industry, beginning in 1979. This qualitative research has been conducted using the historical research method. This study discovered that Koh Lanta is home to numerous ethnic groups, such as Sea Gypsies (Urak Lawoi and Morgan in particular), Thai-Muslim and Thai-Chinese. Each group has unique religious and cultural identities. Most of the indigenous population is fishermen and farmers. Considerable economic changes in Koh Lanta were initiated in the age of tourism development following the Thai government’s promotion of the national tourism industry in 1979. By the time the island was registered as Koh Lanta National Park in 1990, Koh Lanta was well-known for its richness in natural resources and the uniqueness of its multiculturalism. As expected, the island became one of the centers of marine tourism in the area of the Andaman coastal areas of Thailand. Tourism has changed Koh Lanta considerably. Once an isolated self-sufficient community, it is now an open community. The substantial number of tourists and immigrants over this time has had a tremendous impact on the community in Koh Lanta. One important example of change in the island’s economy is that the economy went from being agrarian and marine based, to one based on tourism and services. The increasing rate of investment fuelled the tourist industry’s expansion and also affected the community’s culture. Despite living in a multicultural society amid the rapid expansion of tourism, the people in Koh Lanta presently have been able to sustain their unique ethnic, religious, and cultural identity. They are still capable of living together in peace and harmony. Matthanaphatha is the story of a love triangle between a male deity, a female angel and a man. The life of Matthana, the female protagonist, critically changes because of masculine traits of the characters, Suthet, Chayasen, and herself. Suthet and Chayasen manifest their power in order to possess Matthana. Dissatisfied with being rejected, Suthet curses and transforms the angel into a rose twice: first temporarily, then eternally. Chayasen believes rumors that Matthana has a secret lover. Furious, he orders that she be killed. As for Matthana, she confirms that she has power over her life and chooses to love Chayasen whom she desires. Consequently, due to her display of masculine traits in her decision, Matthana has to suffer being imprisoned as a rose for life. The plot is driven by the expression of masculine traits of the characters and their being challenged. อาจารย์แม่ชีวิมุตติยา (รองศาสตราจารย์ ดร. สุภาพรรณ ณ บางช้าง). จักกวาฬทีปนี: ลักษณะเด่น ภูมิปัญญา และคุณค่า. กรุงเทพฯ: สำนักงานกองทุนสนับสนุนการวิจัย, 2554, 444 หน้า.